Co-produced by Forest Business Network and WoodWorks, the March 22-24 event focuses on advancing the use of wood in mid- to high-rise commercial buildings. Mass timber is one of the biggest game-changers the forest products sector has seen in decades. Modern tall buildings can be built with wood using advancements in mass timber engineered wood products such as cross-laminated timber, a topic to be addressed by global experts at the Mass Timber Conference, March 22-24, 2016, at the Portland Marriott Downtown Waterfront in Portland, Ore. A pre-conference mass timber building tour will precede two days of educational panels. Mass timber is a category of engineered wood framing often using lumber glued together to make large panels of solid wood for use as floors and walls. These massive and extremely strong panels can compete with concrete, masonry, and steel in mid- and high-rise buildings, a focal point of discussions at the event. 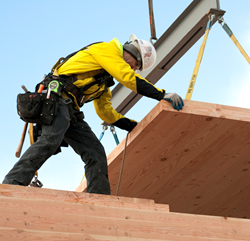 The State of Oregon Building Codes Division approved the use of cross-laminated timber in building construction in 2015, making Portland an ideal location to strategize how to increase the use of a newly rediscovered, environmentally friendly building product: wood. The Mass Timber Conference educational agenda features two concurrent tracks exploring current opportunities and obstacles for cross-laminated timber, nail-laminated timber, glulam panels, laminated veneer lumber, and other mass timber construction in North America and how to execute projects today. Over 45 presenters from the U.S., Canada, Europe, and Australia will bring a global perspective to the panels. An exhibit hall will showcase leading manufacturing companies, government agencies, associations, and universities, all working with mass timber. Meals and breaks will be served in the exhibit hall, drawing attendees to exhibitors throughout the event. On March 22, Mass Timber Conference attendees can take part in a pre-conference tour of newly completed and under-construction mass timber buildings across Portland. Participants will get an up-close view of award-winning buildings and innovative wood design, including the first building in the U.S. to use domestically fabricated cross-laminated timber as a structural component. A detailed agenda, building tour information, interactive exhibit hall floorplan, and more can be found at MassTimberConference.com. Event sponsors include the USDA Forest Service, Hexion, Vaagen Brothers Lumber, and the Softwood Lumber Board. FBN is a top-tier consultancy, event marketing, and news and information source in the forest products industry, and is based in Missoula, Mont. Its website (http://www.forestbusinessnetwork.com) is a go-to news resource for industry professionals. FBN’s President and CEO, Craig Rawlings, is a nationally recognized expert in under-utilized timber and biomass. WoodWorks (http://www.woodworks.org) provides free one-on-one project assistance as well as education and resources related to the code-compliant design of non-residential and multi-family wood buildings. WoodWorks technical experts offer support from design through construction on a wide range of building types, including mid-rise/multi-residential, educational, commercial, corporate, institutional and public.